Jordan, in its capacity as the custodian of the Al-Aqsa mosque, has sent its Foreign Minister Ayman Safadi to Brussels to meet with European Union’s Foreign Policy Chief Federica Moghreini. Muslims have refused to pass through metal detectors erected at the gate to access the mosque but Israeli authorities argue that it is a necessary security measure following the killing of two Israeli police officers around the premises. 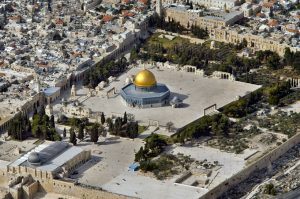 Safadi said “Israel must cancel all its unilateral actions” before the situation degenerates following the series of confrontations that have taken place since last week between worshippers and security personnel. Al Aqsa is the third holiest site in Islam but it is also a sacred place to Jews and Christians. Opening the doors of the compound to all the three religions has often not been an issue but increasing Israeli control over the area and East Jerusalem, where it is located, has raised eyebrows among Muslims and Palestinians in particular, who consider it as a home. Written by: Peter Mulvany on July 21, 2017. Last revised by: Jaber Ali, our reviewer, on July 22, 2017. Posted by Peter Mulvany on Jul 21 2017. Filed under Headlines, World News. You can follow any responses to this entry through the RSS 2.0. Both comments and pings are currently closed.